She’s got a lot of questions. Not unlike an actor researching a role, she responds to my craft questions often with queries of her own. Of course, she is an actor – a famous one – and she studied acting a lot before ever writing songs. In fact, the first time she did try writing a song, she said, she did so by acting out the part of a songwriter. She got in character, and she followed through. Though the sun is blazing full-force outside, here inside the Hotel Café in Hollywood, it is dark. Hours before music will commence, the only light is that of her cellphone, softly illuminating her face as she reads texts from her daughter, laughing. It’s a face I recognize, even in this shadowland, as I’ve loved her for years in movies. She’s famous as that beautiful, mysterious actress that so many of us fell in love with in David Mamet movies such as The Spanish Prisoner and Heist. Mamet also fell in love with her: Married since 1991, they have two children, Clara and Noah. 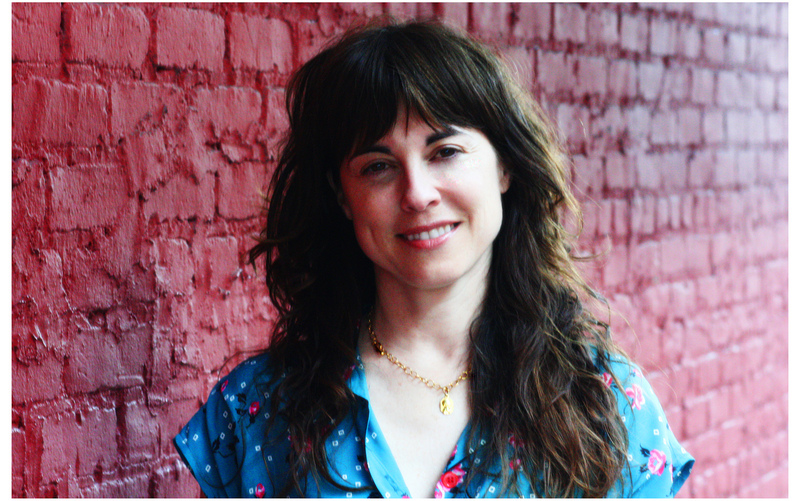 She’s acted in his movies and his plays, and in other movies and TV shows – while also maintaining a vital and concurrent career as a songwriter-singer. The leader of the British band Ruby Blue from 1986 to about 1990, she left to pursue movie work. But soon she was back inside the music, and in 1994 released a beautiful solo album of originals, The Four Marys, which she followed with a collection of Celtic folk songs. She’s got a gentle, understated sweetness to her voice and a winning way with hypnotic rhythms that is always compelling. Greatness abounded on Tough On Crime, which emerged in 2005 with the great Walter Becker, from Steely Dan, on guitar, and the late great Billy Preston on organ. Simmering grooves, fluid soul, smart & crafty songs that soar in many directions at once. She’s the real deal. When she isn’t singing her own originals, she often performs unique takes on famous songs, such as “Spanish Harlem,” the Phil Spector- Jerry Leiber standard that was used in her husband’s movie about the infamous record producer, Phil Spector, starring Al Pacino as the infamous producer. Her great take on Brian Wilson’s “Wouldn’t It Be Nice” reduces it to its purest form, like a laser beam of melody, showing us where the source is under all those harmonies. And when she takes on Warren Zevon’s “Searching For A Heart,” she brings in so much gentle affection to this delicate play of romantic yearning that even Zevon would swoon. She and Mamet met while she was acting in his play Speed-the-Plow during its run at the National Theatre. Evidently a true muse for him, he cast her in a succession of his plays and movies, including The Spanish Prisoner (1997), The Winslow Boy (1999), State and Main (2000), and Heist (2001). For Mamet’s 2008 movie Redbelt, she had a small role and also performed the music in it. She was born to English parents in 1965 in Cambridge, Massachusetts, and grew up Stateside at first while her father, Carl R. Pidgeon, was a visiting professor at MIT. Then in 1970, the family moved to Edinburgh, Scotland, where she fell in love with Celtic folk music. She always loved music, singing it, listening to it, dancing to it. But she wanted to act, and attended the Royal Academy of Dramatic Arts in London, landing several roles in English theater. I was 20 when I started writing really. I was at drama college. Got together with a friend. And this friend and I sung together and played at parties. We thought we’d get something together to send off to record companies. So we sat down and the way I started writing was that I imagined what a songwriter would do, and what I would quite like to listen to. Never thinking of myself as a songwriter. Which songwriters were you thinking of? At that time I was probably thinking of Joni Mitchell. And on the other end of the spectrum, Siouxsie, of Siouxsie & The Banshees. Kate Bush as well. Growing up, did you have musical heroes? Growing up, of course, it was The Beatles in my family. Not so much The Stones. Some Dylan. Then Neil Young. It was all the American crew. I was born in the States – my dad was working at MIT – and my parents got into the American folk thing, and The Beatles. You grew up in Boston? I grew up in Cambridge till I was six, and then we lived in Edinburgh in Scotland. But when I got married, I came full circle and came back to Boston. And we lived there for ten years, in the South End of Boston. I love Boston. You’re a gifted actor. And not a whole lot of songwriters are good actors. Is the craft of acting wholly different from songwriting? I used to think they were very different. Now I realize they’re more similar than I thought. Dave [Mamet] writes as a character – in song and other work – and that is difficult for me to take on. But I find when I allow myself to write from a character point-of-view, it’s quite freeing for me. And that’s similar to acting. I have found that as well, whereas I used to think writing in a character would be restrictive, in fact it gives you license to say things and do things you would not do. It is freeing. Yes, and you can go to an emotional place that’s something quite powerful. I’m moving towards that more in my more recent work. I don’t know why I chose that one. I loved it and didn’t know who wrote it, I didn’t know the Phil Spector connection. I chose it and liked singing it. And then, ironically, Dave ended up writing this movie about Phil Spector, and we used the song in it. Your version of the Beach Boys’ “Wouldn’t It Be Nice” is wonderful. That was the idea of [producer] Larry Klein. At first I balked. I thought, “A Beach Boys iconic masterpiece? Really?” But he talked me into it. Your rendition is so pure – their version is all about all those voices in harmony, and yours is about the melody. Yes. That was Larry’s genius. I love that song. That was Larry’s find. Larry and Warren had been very close, and wrote some songs together. I didn’t know much about [Zevon] except hearing “Werewolves of London” on the radio as a kid. So Larry thought of that song for me. But one nice thing I heard about Warren is that The Spanish Prisoner was a favorite film of his. He is a great writer, truly one of the best American songwriters. He doesn’t get the full acclaim he deserves, yet he’s as great as Tom Waits and Randy Newman. I agree. You wrote “Sweet Hand of Mercy” with David Batteau and Larry Klein. How did that start? That started with an idea David had. Usually I have an idea to start with of my own. He and I have a lovely simpatico together. His resonances speak to me, and I think he feels the same about my work. He is the person I can collaborate best with. Do you usually start with words? Usually. Some time it starts with sort of a jam, and I think I have to do something with that. But then it’s a bit tougher if there’s not an idea first, an angle or something I want to say. What do you think? How do you usually start? I usually start with words, often with a title. I am surprised by people who start with no lyrical ideas at all. Randy Newman said he almost always starts with pure music. Really? That is surprising. Yes, I find a title is a great way to start a song. I haven’t done it that way for a long time. Dave used to give me titles. I should try that again, cause that’s an evocative way to start. Thank you for reminding me. Zevon always liked a good title. 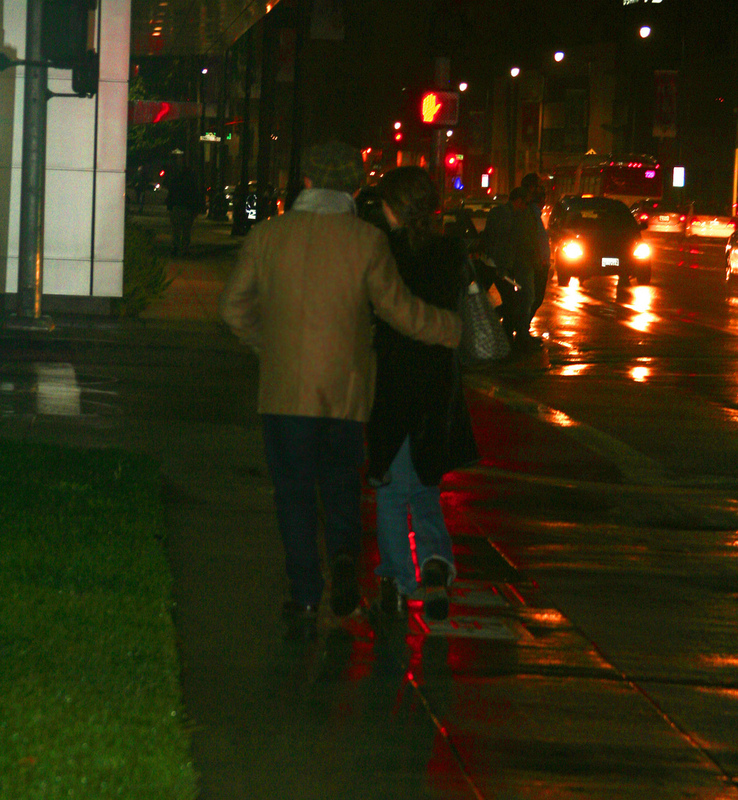 Rebecca Pidgeon and David Mamet strolling home on Wilshire Blvd. You’ve written several songs with your husband, Mr. Mamet. Yes we wrote “Baby, Please Come Home.” We wrote that a while ago. And we wrote a new one on my new album. He’s a great writer, as the world already knows. But is he a good songwriter? Yes, he’s a wonderful songwriter. His style is very different from mine. Much more classic blues. He writes music and words. He writes very male lyrics. Kind of Randy Newman-esque, as you might expect. He writes in character. It’s hard. It is. It’s hard, I find, to write a song I’m happy with. Do you play your songs for him when they are done? Is he a tough critic? Yeah. Sometimes he’ll say, “That’s really not my style, but off you go.” [Laughs] But he doesn’t say, “Oh God, don’t do that.” I mean, we do have different tastes in music. I imagine it can be challenging when two artists are together. It’s not really challenging, no. It works. Thank God it’s not challenging. Do you find there is any time that’s better for writing? Does anything affect what allows a good one to happen? Don’t you find that when a good one happens, it’s sort of easier than the others? It happens faster? Yes. Though I know some writers distrust ones that come too fast and easy. Oh. Interesting. That gives me hope, because most of my songs, they don’t come fast. [Laughs] And when is a good time for me to write? I don’t write all the time, I wish I did. I have to really focus all my attention on it. And I have a lot of other things to do in my life. My family, I have to look after them. I have two kids. I got a cuddle from both of them today. Joy. Clara is 18, just about to move out. She wrote, directed and acted in a movie. Two Bit Waltz. It is really good. She’s it. She’s a filmmaker. She’s amazing. And Noah is 14. And big into beautiful presents. You wrote “Lonely Place” with Freedy Johnston? Yes. We got together. I love him. I came to him with the seeds of this song and said, “Let’s do it.” And we knocked it out in a day. We also wrote “I Loved No One.” Same thing. It was funny. It was like a successful blind date. I walked into a room with him. We had never met before. And we made a song. We have to do it again. But we live in different places. It is like a date, writing a song. It’s intimate. It can be a good date, or not. You have to really be careful of the feelings of the other. Actors usually bring a lot of subtext to their characters, that you know a lot more than we never see. Do you approach songs like that as well – is there subtext there? That helps. Sometimes you know more than the songs tells you, and that is good. That informs the work. Sometimes you don’t, and it remains mysterious. I used to think one had to be so true in a song, for the song to succeed. But one really doesn’t have to be so true. One can imagine things, and slip into that persona and be true about the emotions that you imagine. Sure. You can fudge the facts to make the song work. Exactly! The most important thing is the song. If you have to make it that you’re bereft in the song, so be it. Or desperate. Or happy even! Whatever you need, that is what you need. Whatever works best works best. Each song is different.